and also plays bandoneon — taking part in various TVshows and concerts. However, Yuri has chosen the conducting as his main direction in music. Yuri Medianik’s childhood was a bright kaleidoscope of concerts and tours — he's been taught music since he was 2 years old. His first tour happened to be, when he was just 10. Yuri won 5 competitions as an accordionist and violinist. That’s an interesting fact, that his first record was made at his age of 14 years old, with Bochum Chamber orchestra (Germany). At his age of 15, he became an Honored member of Kaunas Conservatory (Lithuania). 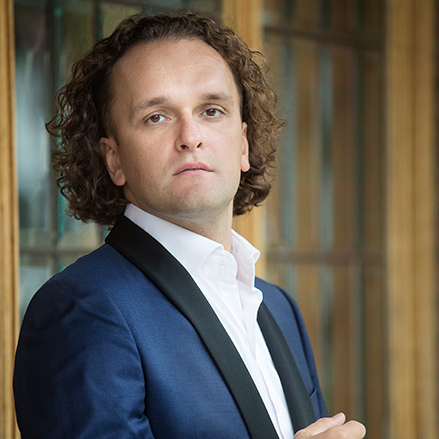 Yuri Medianik studied conducting under the leadership under the leadership of Vladimir Ponkin, for the Post-graduate education he was at the class of Honored Artist of Russia Yuri Simonov. And gratefully, Yuri had the internship with Kurt Mazur. 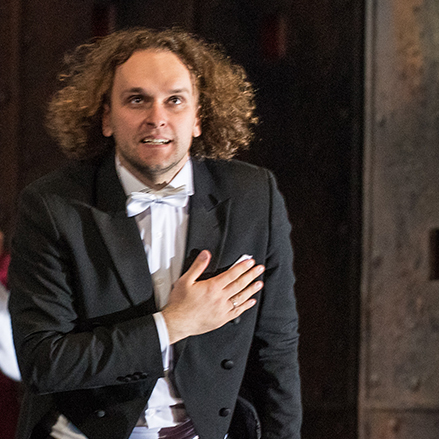 Since 2014 Yuri Medianik has been conducting in Novaya Opera Moscow Theatre. There are more than 10 operas and concert programs in his repertoire. Concerts with Yuri’s participations are broadcasted on Russian TV-channels “Russia. Culture” and “Russia-1”. Such operas as «La Bohéme», «Madama Butterfly» by Puccini, «Lucia di Lammermoor» by Donizetti, «Romeo et Juliette» by Gounod, "The Nutcracker Opera» by Tchaikovsky were performed under the leadership of Yuri Medianik. 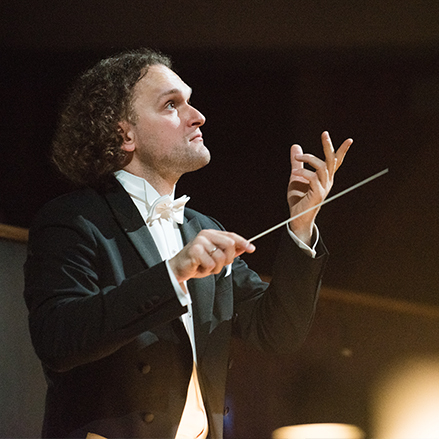 Yuri worked as an assistant conductor with Alexandru Samoilā (Moldova), Arthur Arnold (Netherlands), Jan Latham-Koenig (UK). In 2018 Yuri has become the Principal Guest Conductor of First International Vocal Competition in DPRK. Yuri collaborates with such orchestras as: Royal Bangkok Symphony Orchestra (Thailand), Israel Camerata Jerusalem, Ashdod Symphony Orchestra, Russian Philharmonic Orchestra, Rostov-onDon Symphony Orchestra, Kaliningrad Symphony Orchestra, Volga Philharmonic, Samara Virtuosos orchestra, ‘Russian Camerata’ chamber orchestra, Taurida International Symphony Orchestra. The are various names of worldwide recognized musicians with whom Yuri collaborates, soloists such as: Vadim Repin (violin), Maxim Vengerov (violin), Erwin Schrott (baritone, Uruguay), Avi Avital (mandolin, Israel), Boris Berezovsky (piano), Olga Sheps (piano, Germany), Vanessa Benelli Mosel (piano, Italy). One of many of the talents inherent by Yuri - is his ability to unite famous musicians in orchestras and ensembles. In such way in 2007 he became the founder of Pluri Art Orchestra. At the same year orchestra was one of the guests in the festival “Opera Ischia” (Italy”, participated in the performance of operas «La Bohéme» by Puccini and «Il barbiere di Siviglia» by Rossini. In 2008 in Norway Pluri Art Orchestra performed the world-premiere of the composer Flint Joventino in Beppe. Since 2009 the orchestra has participated more than in 10 festivals in Moscow. 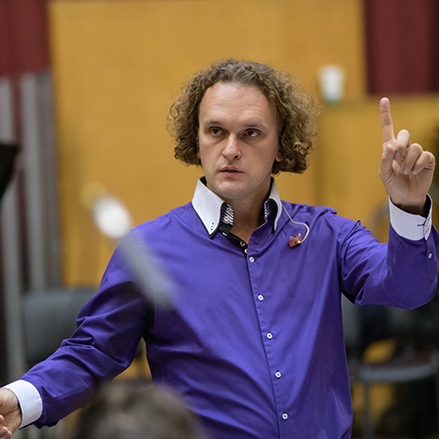 In 2016 Yuri Medianik became a founder and conductor of the VGTRK Orchestra. Where the abbreviation "VGTRK" stands for All-Russian Broadcasting Television State Company. The unique compound of the orchestra combines academic Instruments with drum-sets, guitars, synthesizers and brass-section. The orchestra performs music of different periods and genres, from Baroque opera arias till jazz and cross-over music. At its first season the VGTRK Orchestra became the main orchestra of TV-competition “Blue Bird”. Until 2019 only this orchestra accompanies the participants. The VGTRK Orchestra has expanded its repertoire almost to 200 pieces. The audience reached almost 80 million people and it made this competition and orchestra one of the most famous on Russian Television. Besides all tremendous musical achievements, since 2017 Yuri Medianik is an ambassador of beneficial fund “Be the human”. The fund was created for the great purpose of helping children with heavy illnesses. 2016 - 2018 Post graduate at Institute of music n.a. Ippolitov-Ivanov (conductor). 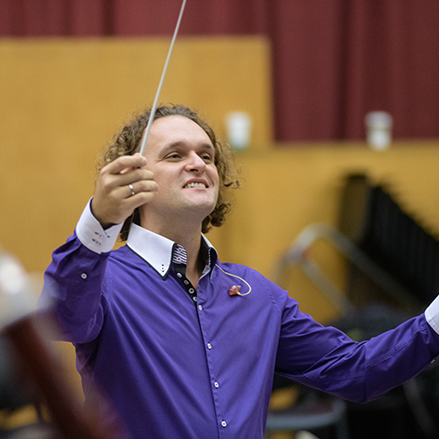 2015 Assistant-conductor at Institute of music n.a. Ippolitov-Ivanov. Professor: Vladimir Ponkin. 2006−2009 Post graduate in Tchaikovsky Moscow State Conservatory (violin). Supervisor: A. Bogdanyan. Thesis theme: Franco-Belgian Violin School between the 18th and 20th centuries. 2017 - Debut with the Royal Bangkok Symphony Orchestra. 2017 - Debut with the Symphony Orchestra «Saint-Petersburg» as a Principal conductor of gala concert with the participation of FIFA resident and all the members of FIFA 2017. 2017 - Performances of the concert program «Songs of the Victory» at Novaya Opera Kolobov Moscow Theatre and Moscow International Performing Arts Center. 2016 - «TenorS of the XXI Century» in Israel. Debut with Ashdod Symphony Orchestra. 2016 - Conductor of the concert tour (Tel Aviv, Haifa, Ashdod) of «TenorS of the XXI Century» in Israel. 2016 - Performances of the opera «La Boheme» by Puccini at Novaya Opera Kolobov Moscow Theatre. 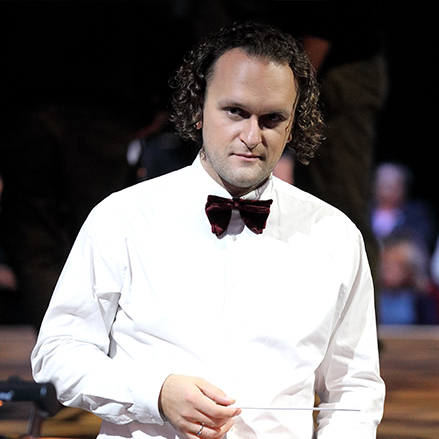 2015 - Conductor of «Nutckracer.Opera» by Tchaikovsky at Novaya Opera Kolobov Moscow Theater. 12 performances. 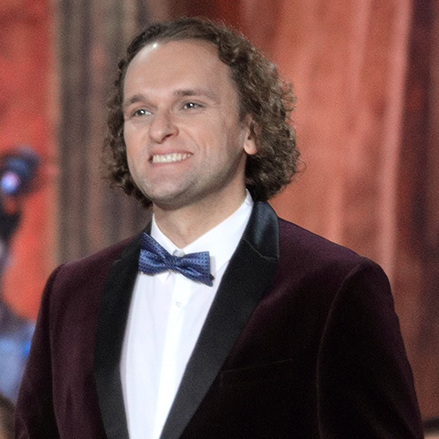 2015 - Second Conductor of «La Boheme» by Puccini at at Novaya Opera Kolobov Moscow Theater. 2014 - Conductor of Anniversary concert - the art-project "Tenors of the XXI century" in Crocus City Hall (Moscow). Symphony Orchestra of the Kolobov Novaya Opera Theatre. Conductor. 2014 - Participant of the New Year's concert at the Kremlin, by personal invitation of Vladimir Putin. 2014 - Debut with the Netanya Kibbutz Orchestra (Israel). Conductor. 2014 - Artistic director and conductor of the Festival Orchestra "Russian field"
2014 - The engagement of the festival "Jazz Rally", Dusseldorf (Germany). Premiere of «Vivaldi. Four Seasons of Tango"
2014 - The engagement of the festival "Far Eastern Spring"
2012 - debut with Kaliningrad Symphony Orchestra. Conductor and soloist. 2011 - contributor (co-author) in making Melodies to Remember – a series of programs on tango. NTV Mir Channel. 2008-2018 - Art Director of Young Talents’ Performance – a number of subscription concerts in the Rachmaninov Hall of Moscow Conservatory. 2007 - Co-organizer of Opera Ischia Festival (Italy), producer and art director of Pluri_Art & Opera Ischia series of concerts. 2007 - Founder and Art Director of Pluri_Art Orchestra. 2007 - Founder and Art Director of Yuri Medianik and Emotion-orchestra Project. 2007 - Vice President of the Russian Bayanists and Accordionists Association (Moscow). 2005 - Honorary member of Kaunas Conservatory (Lithuania). Anna Netrebko (soprano), Hibla Gerzmava (soprano), Erwin Schrott (baritone), Maxim Vengerov (violin), Veronica Dzhioeva (soprano), Denis Matsuev (piano), Andrey Gugnin (piano). Alexey Bogdanchikov (baritone), Vladimir Baykov (bas), Federico Lepre (tenor), Daniel Kramer (piano), Yuliana Avdeeva (piano), Igor Butman (saxophone), Pavel Vernikov (violin), Alena Baeva (violin), Boris Andrianov (cello), Aydar Gaynullin (bayan), Konstantin Volostnov (organ), Artem Dervoed (guitar), Roger Vigulf (clarinet), Sebastian Arce (tango dancer), Alexandra Pakhmutova (composer). Vladimir Spivakov (Russia), David Handel (USA), Pacien Mazzagatti (USA), Vladimir Ziva, Sergey Skripka, Vladimir Ponkin, Felix Korobov, Pavel Ovsyannikov, Sergey Tararin, Timur Mynbaev, Enche Baartazhavyn. Chuncheon Symphony Orchestra (South Korea), Pyongyang State Symphony Orchestra (DPRK), Moscow City Russian Philharmonic Orchestra, Royal Bangkok Symphony Orchestra (Thailand), Netanya Kibbutz Orchestra (Israel), Ashdod Symphony Orchestra (Israel), State Symphony Orchestra of Udmurtia Republic (Russia), Symphony Orchestra of Novaya Opera Kolobov Theatre, Symphony Orchestra of the Russian Ministry of Defense, Tchaikovsky Symphony Orchestra, Rostov-on-Don Symphony Orchestra, Musica Viva Orchestra, Moscovia Chamber Orchestra, Vivaldi Orchestra, Four Seasons Orchestra, 21st Century Orchestra, National Moldova Orchestra, Ministry of Culture Symphony Orchestra of Republic of Bashkortostan (Ufa), Symphony Orchestra of Samara Philharmonia, Zhukovskiy Symphony Orchestra, Ministry of Culture Orchestra of the Udmurt Republic (Izhevsk), Kaliningrad Symphony Orchestra, Symphony Orchestra of Saratov Philharmonia, Classica Chamber Orchestra (Chelyabinsk), Gnessin Virtuosi, B.A.C.H. (Yekaterinburg), Osipov Russian Folk Orchesstra, Vyatka Russian Folk Orchestra of F.I. Shalyapin (Kirov), Government Folk Orchestra (Cherepovets), Urals State Folk Orchestra (Yekaterinburg). 2010 (May) North Korea. Tour with Pavel Ovsyannikov Orchestra. 2009 (April) Russian tour with Emotion-orchestra . 2006 (January) France. Recital tour. 2005 (March). Lithuania. Recital tour.